The California Fire Foundation invites you to join us memorialize the sacrifice and dedication of California’s fallen heroes at the 17th Annual California Firefighters Memorial Ceremony on September 28, 2019 at 11:30am. The ceremony will be held at the California Firefighters Memorial located in Capitol Park, Sacramento, CA. CLICK HERE to view photos from the 2018 California Firefighters Memorial Ceremony where we remembered those heroes who made the ultimate sacrifice to keep California safe. California Fire Foundation will be reserving a room block for the nights of September 26-28, 2018 at the Sheraton Grand Hotel in Sacramento. To reserve your room, call (800) 325- 3535 and be sure to request a room in the California Fire Foundation room block. 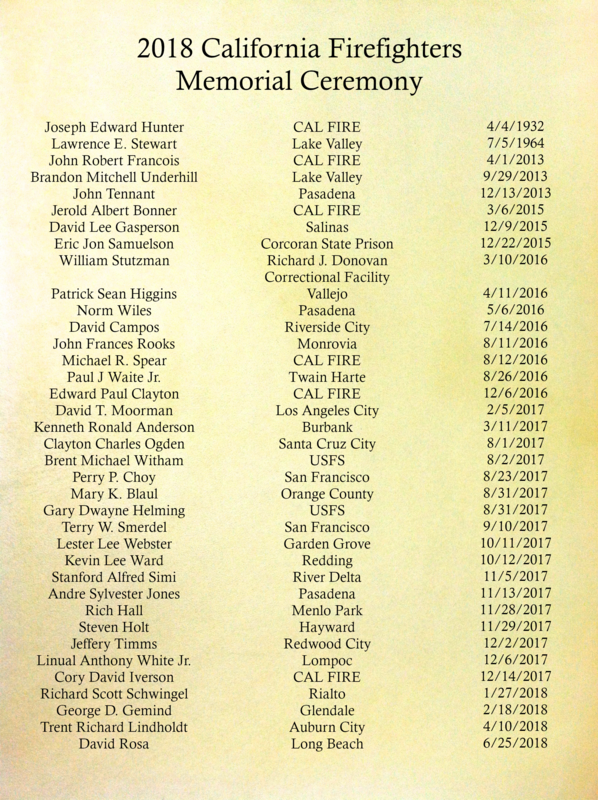 NOTE: Deadline for accepting completed Memorial Wall Applications for the 2019 California Firefighters Memorial Ceremony is May 1, 2019. CLICK HERE to access the Memorial Wall application. Questions can be directed to California Fire Foundation Program Manager Sara Rogers at 916-641-1707 or srogers@cpf.org.